Mrs. Clinton’s appearance, at a conference of the National Association of Black Journalists and National Association of Hispanic Journalists, was described after the fact as a news conference, though it was really something of a hybrid [combination] with a campaign rally. She took seven questions. Most were softballs, but not all. 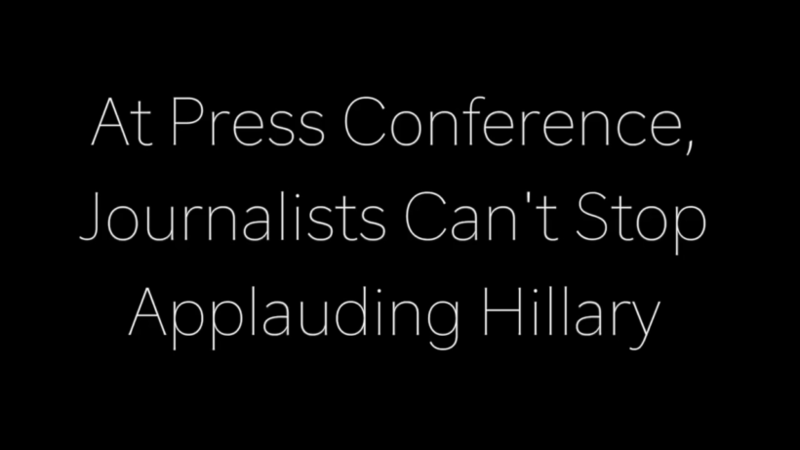 So was she speaking to journalists or to supporters of her candidacy? Before we consider Rutenberg’s answer, let’s try offering one of our own: Maybe you shouldn’t. If you have such a strong opinion about one of the major candidates, perhaps you shouldn’t be reporting on the election. You could request a transfer to another beat, or to the opinion section. If you really feel strongly about preventing Trump’s election, perhaps you should consider a career change. You could go to work for Mrs. Clinton’s campaign, or for one of the many independent advocacy organizations that support it. If you believe all of those things, you have to throw out the textbook American journalism has been using for the better part of the past half-century, if not longer, and approach it in a way you’ve never approached anything in your career. This, however, is what being taken seriously looks like. Hang on a second. Is Rutenberg claiming that journalists – who, whatever their biases, have heretofore maintained at least the pretense of fairness and balance – have never taken a candidate seriously before? Or that they are not taking Mrs. Clinton seriously? Another way of putting the media-bias complaint is that conservatives – including some who oppose Trump – have long seen the media as tilting toward the Democratic Party and taking an “oppositional” posture toward Republicans. Rutenberg is recommending that they dispense with the veneer and embrace open partisanship [bias]. Second and more important, the premise of Rutenberg’s column is that reporters have already made up their minds about Trump. If that is the case, then what they are ferreting out is facts that reinforce their preconceptions, and that they hope will persuade voters to cast ballots against Trump. That’s called “opposition research,” and it is a job for campaign operatives, not journalists. Rutenberg acknowledges that the approach he recommends “is more than just a shock to the journalistic system. It threatens to throw the advantage to [Trump’s] news conference-averse opponent, Hillary Clinton, who should draw plenty more tough-minded coverage herself.” Well, yeah—though that would seem to be the objective, would it not? The greater threat from the abandonment of journalistic standards is that it compounds the danger to the country if Mrs. Clinton is elected. In that event, our partisan press would no longer be oppositional. They would be mere servants of power, to an even greater extent than they have been for the past 7½ years. a) Do you agree with Mr. Taranto’s assertions? Explain your answer.